If you've been following along, you might know that this season's giveaway will be tied to the baseball simulator OOTP (Out of the Park). What you may not know is that I have never used OOTP before. As I set out to merge the world of PackADay with the world of OOTP, I emailed Brad at OOTP and let him know what I was trying to do. As with any venture where the primary purpose of a program gets stretched beyond the intended limits, I hit a few snags. They weren't going to stop the show, but I will have to combine some of the things I do manually with some of the cool features of OOTP. As I set out to create leagues and teams, I was having a hard time pulling in actual players. Brad and I emailed back and forth as we tried working through the problem. Finally, he asked me to upload my files so he could take a look. When he let me know that he could not only duplicate the problem (no players would show up in the draft, even though the program said they were imported) but that he had never seen anything like it before, I know I had something special on my hands. Turns out, I managed to corrupt my game. I am pretty sure that happened during the creation of my custom league. I am not a "read the manual" kind of person. I am not sure reading the manual would have helped for what I am trying to do, but messing everything up the first time certainly helped. Mind you, this support took place over the course of more than a week, over a ton of email exchanges. I would also like to note here that as a member of the BBA, I received my copy for free in exchange for posting about the program. 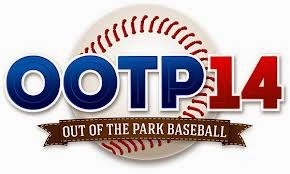 My original plan was to (and still is to) incorporate OOTP as part of this season's breaks. What I did not anticipate was the incredible level of patient support I would get from OOTP just getting things off the ground. Thanks to Brad and the great folks at OOTP who are providing OOTW service! OOTW!? Yeap! Out of This World! The window for joining the break has closed, and we have 44 managers this season! Follow along as I get things ramped up for the initial draft, daily pack breaks and a baseball simulation that ties it all together! With the first pick in the draft, 2x3 Heroes selects, from St. Joseph, Michigan - Katherine....Upton. "The scouts say she can't throw and her peripherals are subpar, but I'll be hogtied if we haven't sold out every game since she signed the contract." Haha! You guys are nuts! I love it!